Create Along: I design yarn! OK, I thought I'd introduce myself too and a little about my knitting. Edna! I live mere blocks from you (well, maybe about 10 blocks). I've been meaning to stop in your store and now I will - because I sort of feel like I've met you. In fact do you carry the yarns we're limiting ourselves to? I recently lost my job as a biochemist and now I design yarn which will eventually go under my Chameleon Colorworks label. I would say "for a living" except I don't make a living at it yet. 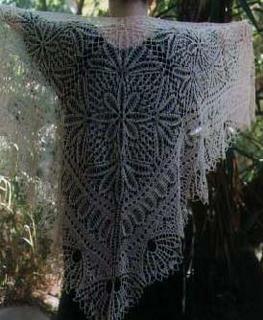 I am hoping to launch my yarn at the summer TNNA in Ohio. I am also a heavy duty spinner and I put out an online magazine about spinning, Spindlicity. One of the things I need to help sell my yarn is pattern support and so I've started knitting a lot again because I can't afford designers yet. I'm now going full circle back to the thing that got me into spinning and yarn design in the first place! My original goal in all of this about 18 years ago was to be a knitwear designer. So I am really looking forward to having people give me feedback. I have designed nearly everything I knit, but I rarely write down the pattern and even more rarely make it accessible to other people. 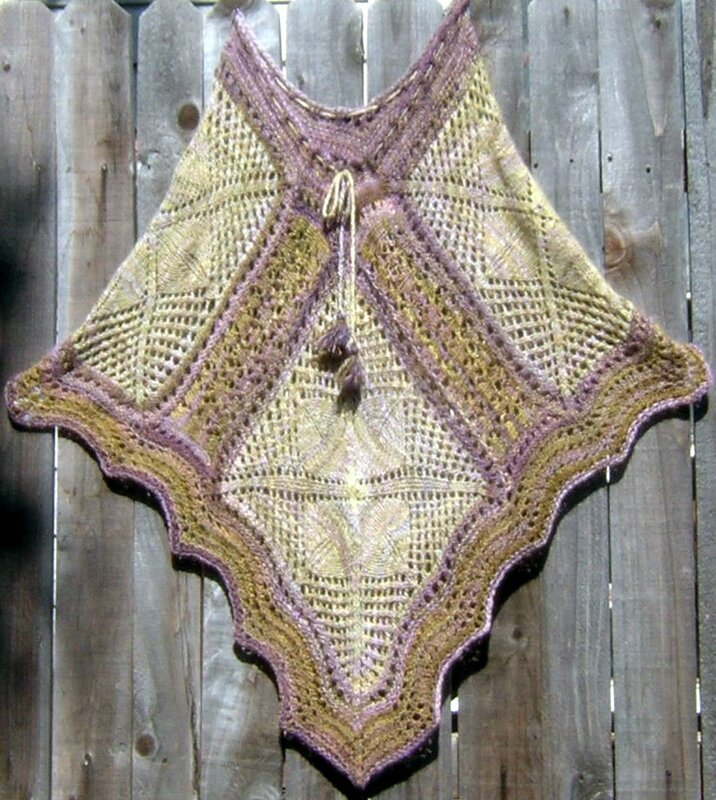 This last year I have published several patterns in my magazine Spindlicity like these socks and this doubleknit fulled purse with pockets inside and out, and here's a poncho from last year made from handspun yarn and an older lace shawl pattern from about 10 years ago. I have yet to publish a sweater pattern. So that is my next goal. I am a complete novice regarding pattern sizing so that is also a goal here. If any of you have constructive criticism regarding the pattern writeups I have in Spindlicity I would love to hear them. Writing out the patterns is still pretty hard for me. I'm not familiar with any of the yarns we'll be using so that will be sort of an adventure for me. I'm also a self-taught knitter so occasionally I might ask the name of a technique that I understand what it does but not what it's called. I recently discovered that the way I knit is called a combination knitter (knit continental and purl using the continental scooping method or whatever that purl method is called) which causes different stitch mount depending on whether I am knitting in the round or in the flat. For the longest time I had no idea the difference between SSK and K2tog because it would change depending on my stitch mount, but I would just think of it as this is the way my stitch is facing and that's the way I want the decrease to lean. However that's not too easy to write into a patter, so I've now made an effort to learn it. I also have a funky way of casting on that is unique to me I think. So my goal with all of this is to learn more accessible ways of doing things, and how to write them out so someone else can understand what the heck I'm trying to say. I'm currently designing a series of socks for my sock of the month club, so every month I have to design a new sock. This has been a wonderful exercise for me to learn all that stuff I just said above. But for this group, I think I'll try to dive into a sweater. OK, I've rambled on quite a bit. I look forward to seeing what we all create. Oh yeah, my name is Janel and I live in Silverlake and my blogger account is for a blog for a cruise I'm hosting to Alaska so that's why my name shows up as Cruise to Alaska or whatever. Janel, I'm a combined knitter too. Must come from teaching oneself. I'd be happy to help you in any way I can. If I could recommend one book for an aspiring garment designer, it would be Sweater Design in Plain English by Maggie Righetti. I've read the book twice. Welcome aboard, Janel! You should definitely check out Edna's. She has a really eclectic little shop. I love her style. P.S. A lot of the really talented knitters I know are combined knitters. It seems to go with the territory in creative types. I'm just a plain old knitter myself, but am always happy to help with patterns.